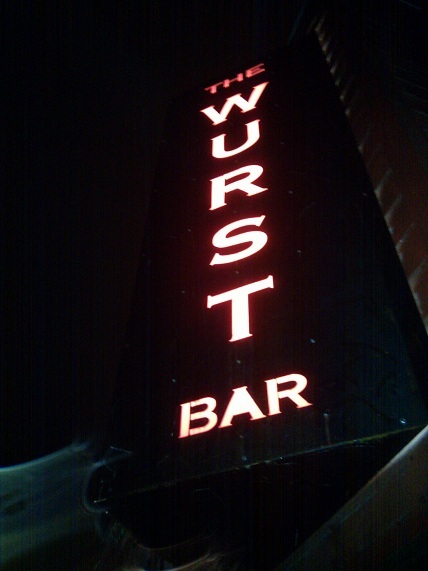 So on Friday night I finally had a chance to go to the Wurst Bar in Ypsilanti, which opened earlier this year. Everyone I know had pretty much sung the praises of this place, and even if they hadn't, the concept of a bar serving good beer with a menu full of sausages would have eventually drawn me anyway. The cool thing is, all the praises were deserved. The space is large and comfortable, the jukebox is good, the staff all wear t-shirts with take-offs on famous album covers like Metallica's Kill 'Em All and The Misfits', well, anything with that skully thing on it. Yes, in a way the bar is a little self-consciously hipster-y, and I saw more than one "ironic" mustachioed dweeb come through the door, but there are more than enough things to make up for it. For example, how about $2 draft beers every Friday night beginning at 8 p.m.? Now, true, there are only six taps, but they're all devoted to awesome Michigan beers, and oftentimes they're from breweries you don't see on tap everywhere, like Greenbush and Odd Side Ales. And $2? That's, like, PBR prices, so you can even maintain your hipster cred. That's a pretty good list right there, and I should mention the Alligator and Crawfish Boudin on the menu was good enough to help ease the transition from my recent amazing culinary experience in New Orleans to the disappointed-everything-isn't-as-amazing-as-New-Orleans-food doldrums that always accompany me when I come home. So, in short, go to the Wurst Bar. It's cool, er, I mean, hip. They have good beer. They have great happy hours. And they have some tasty (but of course still not-New Orleans) food. Plus, being served by people in Misfits-style shirts is entertaining. For a more detailed take, check out Evan Hansen's recent review in the Metro Times.